Here is the metal working lesson for today. This is a lesson that applies to the masses because most of us don't have the $50,000 mandrel tubing bender sitting in your shop. 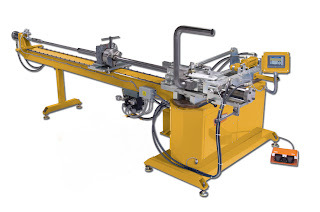 The idea behind the mandrel bender is just like every other tubing bender. It bends the tubing over a die that has the same radius as the bend you are looking to make. Its very simple and there is a ton of different styles of benders but the idea is simple. The problem that comes about with a lot of people that buy cheaper tubing benders from mail orders and such is the tubing that " can be" bent is very thick wall tubing. The reason is because its strong enough not to wrinkle as it is bent over the die. The wrinkling is a very big problem with most tubing benders once you go to tubing thinner then about .080" of an inch or a little over 1/16 of an inch. The beauty in this machine is the mandrel that acts as a spine on the inside of the tube as it is bent over the die. The mandrel is constructed like a spine with the ablity to stay inside the tube while it is bent. see the picture - the spine pieces are all made out of brass so they are softer then the material and slide easy. Still used today, by aerospace fabrication shop for special jobs. The idea of filling the inside of tubing with sand or water and freezing it, then performing the bending operations. The sand or ice acts as the mandrel and keeps the tubing from wrinkling. The sand works the best and is used about 90 percent of the time because of the speed and ease of set up. The water filling is used mostly on materials where any form of contamination could cause problem later or not pass spec. Such as a crazy titanium piece intended for aircrafts, they wouldn't fill it with sand because if the tube didn't get a perfect 100% clean a spec of sand could later in the process get in to the weld and create a weak zone. But most of the time at that point you should just spend the time and money to make the crazy mandrel to pull off the job correctly and not use ice at all. I have been building a crazy concept bicycle with no straight tubes using paper thin 4130 chromoly tubing. The tubing is .035" thick or about 35 pieces of paper thick. I can't show the bike because its secret but i can so you the process of building the bike. Here is my how to poor man's mandrel bending. What if i pushed an end cap in each side. Will the sand do pressure and push the caps out?